Memories to be made in this vintage Lake Arrowhead home. 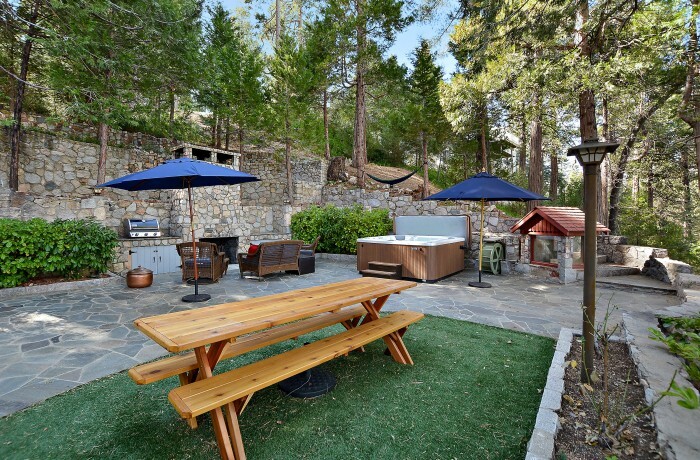 Warm & Woodsey retreat, situated on 2 lots, just above Lake Arrowhead Village. Wonderfully updated and maintained featuring 3 bdrms, 2 baths & a bonus room. Master is on the main level w/its own bath & walk in closet. Spacious living area with massive rock fireplace, dining area, updated kitchen with slate counters, oak cabinets, stainless appliances & a quaint breakfast nook surrounded by custom stained glass. Upstairs are 2 more large bedrooms & 3/4 bath. Peeks of the lake & beautiful tree views throughout. Lowest level has laundry/utility room & bonus room for extra guests or game room. Amazing outdoor patio area with Split face granite fireplace & built in BBQ. Nicely landscaped w/full irrigation. You must see this home to appreciate all of the fine details and charm that it has to offer. You will not be disappointed.